On Monday, I wrote about Ubuntu edge, a proposed smartphone that will run a version of Linux optimized for phones that also allows you to use the phone as your desktop computer (which is the feature that I was particularly excited about). In order to produce the phone, Canonical, the company behind it, is turning to crowdfunding. On IndieGoGo they are trying to raise $32 million in just 31 days. If they succeed, it will be the largest crowdfunding project ever (and if they don’t, it is still the most ambitious). But, can that amount of money actually be raised through crowdfunding? The campaign started off great. In the first 24 hours, they raised $3.4 million, helped by both a lot of press coverage and a special deal that was only good for the first 24 hours ($230 off the regular price). But, after the initial press ran its course, the pledges plummeted. 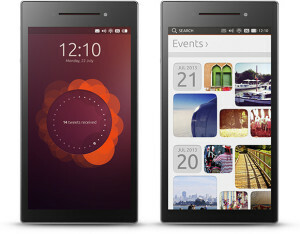 Canonical responded by offering more deals, at prices of $625, $675, and $725 (the full cost of the phone is $830), each good only for the first 1250 people to get it. This worked. The money started coming in quickly again. It makes sense — people wanted to feel like they were getting a deal and the price difference is significant, the limited number of available deals creates a sense of urgency, and the move generated another wave of press. As of now, they’ve generated just over 6 million in just 3 days. They’re almost 20% of the way there. Whether they succeed or not, that’s pretty astonishing. But can they succeed? The people who were most enthusiastic and excited about the project have probably all already pledged. Canonical can’t keep offering new deals either and have them remain effective, since it then feels like they are just lowering the price point of the handset and the sense of urgency would go away. Plus, there’s just no way they can keep this in the media constantly; the news cycle is such that stories have a life of 24 hours (or less) and then they’re off all the front-pages. So, for these reasons, I have my doubts. I’m rooting for them though, and I would really like to see this phone become a reality. Looking at the bigger picture, is there a limit to the amount that can be crowdfunded? How many people are savvy enough to know about it, and comfortable plopping down real money for a product that doesn’t exist yet? I definitely do not know the answer to this, but the largest projects on Kickstarter to date have raised over $10 million. Frankly, I am surprised at how large of a number that is. Maybe, just maybe, the internet will surprise me again and the Ubuntu Edge will add a new page to the record books.